Is it possible to watch DVD movie video on iPhone 7? Just check the answer here. 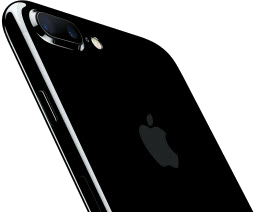 Apple's new iPhone models, iPhone 7 and iPhone 7 Plus, have been unveiled. New iPhone ditches headphone jack, introduces advanced new camera systems, immersive stereo speakers, splash and water resistance, the brightest, most colorful iPhone display yet, etc. Here, we won't talk more details about iPhone 7 features, instead we will show you how to play DVD on iPhone 7 and iPhone 7 Plus. You only need a DVD converter to convert DVD to iPhone 7 playable formats. Thus, you don't need to juggle your DVD discs and can watch the DVD movies videos on iPhone 7 anytime anywhere. Tip: This article is also helpful when you want to play DVD on iPhone 8(Plus), iPhone X and other generations. 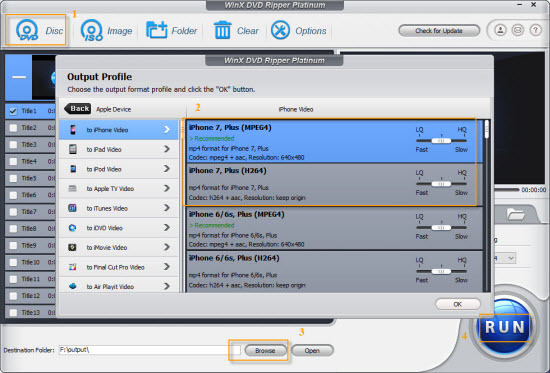 WinX DVD Ripper Platinum can rip any home-made and copy-protected DVD to iPhone X, 8, 7(Plus), iPhone 6S(Plus), iPad, iPhone, Apple TV, iTunes, Android, etc. without any troubles. As mentioned below, all you need is a DVD converter to make DVD playable on iPhone 7. 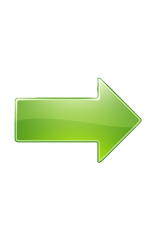 So, the first thing you need to do is to download and install a suitable DVD converter. There are too many choices in the market, but some may not satisfy your needs. Then, which one to download is a big problem. Fortunately there's a good option for those who want to play home-made DVD and also commercial copy-protected DVD on iPhone 7, namely WinX DVD Ripper Platinum. WinX DVD Ripper Platinum is a professional DVD converter for Windows 10, as well as lower operating systems like Windows 8 and Windows 7. It is specially designed to rip any DVD, be it unencrypted or locked by region codes and strict copy protection schemes, to popular devices like iPhone X, iPhone 8, iPhone 7(Plus), iPhone 6/6S(Plus), iPad, Apple TV, Android Samsung, Windows Phone and common formats like MP4, MOV and 3GP. Thanks to the support for hardware acceleration, Multi-core CPU (up to 8) and Hyper-threading technology, it can rip a DVD to iPhone 7 in a matter of minutes. And High Quality Engine ensures that the output quality is distinct as the original. How to Play DVD on iPhone 7(Plus)? First of all, download WinX DVD to iPhone 7 ripper on your computer. After that, install and launch it. Then, you can follow the steps below. Step 1. Insert target DVD into the DVD drive of your computer, and click "DVD Disc" button to import the DVD information to the ripper. This intelligent software can detect the main title for you automatically. If the auto-selected title is not the one you need, you can also specify it by yourself. Tip: You can also load ISO file and DVD VIDEO_TS folder for converting to iPhone 7. Step 2. Specify an output profile. To play the DVD video on iPhone 7(Plus), you can select a iPhone 7 profile under Device Profile -> Apple Device -> to iPhone Video. Step 3. Hit "Browse" to choose a folder to store the reformatted video. Step 4. Press "RUN" button to begin copying DVD to iPhone 7 accepted format. Once finished, you can transfer the DVD video to iPhone 7 for playback while commuting or during the trip. Tip: The software developer only advocates copying DVDs for personal use and suggests referring to DVD copyright laws in your countries before doing so. WinX DVD Ripper Platinum can convert any DVD to MP4, AVI, MPEG, MOV, WMV, FLV, M2TS, TS, iPhone, iPod, iPad, Android, Samsung, HTC, Microsoft, Google, Sony, Nokia, Asus, Acer, etc. at fast speed in excellent quality. Meanwhile, it makes perfect 1:1 DVD to ISO image/DVD folder copy and clone DVD to multi-track MPEG2 file with 5 minutes only. Constantly update to defeat upcoming DVD copy protections.